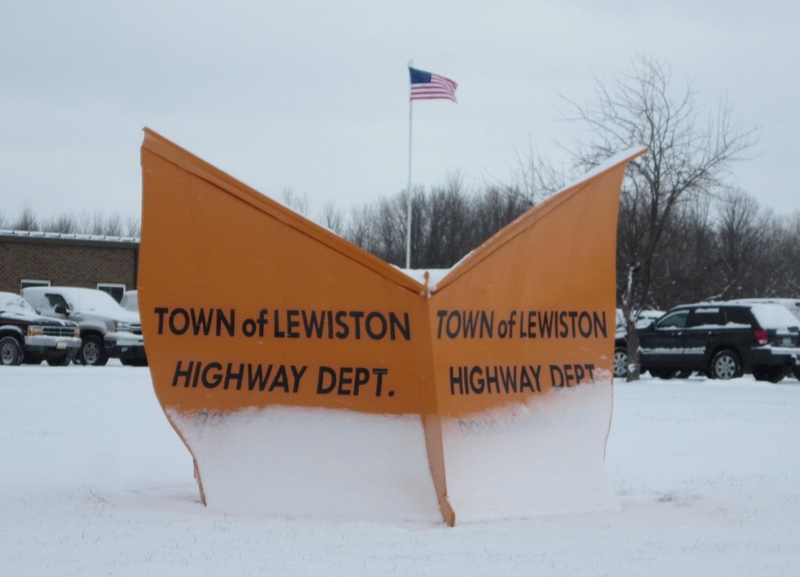 The Town of Lewiston Highway Department is responsible for road plowing, paving and maintenance as well as leaf and brush pickup, tree trimming, drainage ditch maintenance, roadside mowing, and traffic signs within the Town. Please separate brush from yard waste/leaves and have cut ends facing the road. Yard waste/leaves should be raked to the street line for collection. Please do not put the debris in the street. Village of Lewiston residents need to contact the Village Municipal Center located at 145 North 4th Street, 754-8271 for any highway inquiries. The Town of Lewiston Highway Department is dedicated to providing safe, courteous, dependable and economical service, wherever and whenever possible, for all our residents. The Highway Department’s efforts and success would not be possible without the support of the Town of Lewiston Town Board. Again this year, the Supervisor and Councilmember’s have provided the funds necessary to purchase and maintain the equipment and materials necessary to get the job done. They should be congratulated for their foresight and their interest in public safety. You, the Town of Lewiston taxpayer and resident, are a very important part to a successful snow and ice control campaign. Your understanding and cooperation are an integral part of our plan. To help inform you regarding our methods and give you a few helpful hints, we have compiled the following text. Again, I would like to stress this is a team effort and I would like to give thanks to all of our Highway Department employees, the Lewiston Town Board, the Niagara County Highway Department, the Town of Lewiston Police Department, the Niagara County Sheriff’s Department, the New York State Police, the Volunteer Fire departments and Ambulance Corps, the Lewiston-Porter and Niagara Wheatfield School Districts, our neighboring highway departments and all of the residents of the community for working together to provide a safe and healthy environment in the Town of Lewiston. It is the Town of Lewiston’s policy to provide winter road maintenance service through its Highway Department. The goal of this policy is to provide for safe and efficient transportation, within the constraints of the Town’s budgetary resources, to the traveling public on all roads maintained by the Town of Lewiston. The Town of Lewiston by its nature is similar to many other towns in Western New York that border the Great Lakes. This unique geographic characteristic can at times create difficulties when dispatching maintenance vehicles. In an effort to provide a safe driving experience the following reasonable written plan of service shall be administered. This does not include trees in wooded areas behind homes. If you utilize the services of a contractor, they are responsible for the cleanup of the trimmings. Branches must measure ten (10) feet or less in length. All branches MUST be no larger than three (3) inches in diameter. All branches MUST be piled as neatly as possible with all the cut ends facing the road, piled as close to the road as safely as permits, approximately waist high. Do not place brush on the road, this creates a safety hazard. This enables crews to pick them up quicker and easier. Please make separate piles. Logs in one and branches in another. BRANCHES MUST BE FREE OF ROOTS AND DIRT. We do not pick up grass clippings, rocks, stumps, leaves, twigs, vines, building materials, rubbish, etc . . . Please do not put these items out with your branches. We will not pick them up as they pose a great danger to the men and equipment. We do not go onto private property. Please do not request us to do so. Beginning as early as September, the Town of Lewiston Highway Department begins preparing for the winter months ahead by reviewing snow removal routes, interfacing with school districts personnel in regards to bus routes and turn-a-rounds, and servicing maintenance equipment. Preparation and servicing of equipment for the upcoming winter continues through November. November is an extremely critical time, as the equipment used for snow removal operations is used for other things and our focus can change at very short notice. The Highway Department’s salt storage facility is stockpiled with 1700 tons of de-icing salt. In order to be properly prepared for inclement weather during the snow season, the Highway Department continually monitors daily weather conditions via satellite and receives daily weather reports from local weather sources and the National Weather Service. The Town of Lewiston is split into 8 distinct plowing routes. These plowing routes are designed to avoid overlap of service and to accomplish a complete maintenance cycle in 3 hours. Call out after a storm event shall begin @ 3:00 am, a start time of 3:30 am should allow all bus routes to be treated by 6:30 am and all roads to be treated by 7:30 am. For storm events that occur after or during the morning commute, maintenance runs will begin at approximately 12:00 noon to allow for school bus routes to be treated before the normal dismissal time. Should precipitation continue; runs will continue until evening commute ends. Under most circumstances all maintenance will end by 7:00 pm. Severe weather conditions (i.e. freezing rain/roadway icing) may dictate that maintenance might continue after the 7:00 p.m. end or before the 3:00 a.m. start time frame for the safety of the highway department personnel. It should be understood that unusual situations (i.e. manpower shortages, extreme weather events and mechanical malfunctions) might change these time schedules. Every effort to accomplish these maintenance schedules shall be attempted. An important step in dealing with snowfall is road and street salting. Top priority is given to the Town’s main roads. Those roads are routes that the Town has found to be the heaviest year-round traffic and usually are major arteries running north/south or east/west that have double yellow centerlines. School bus routes are also given top priority. The snow removal process starts when frozen precipitation begins falling. Operations initiate with the application of salt to the roads and continue until the roads or streets are clear or material application is no longer effective due to the depth of the snow. When two or three inches of snow have accumulated and more is expected, snow is more economically removed by plowing rather than salting. Town highway department personnel will plow all roads that the Town of Lewiston is responsible for performing winter maintenance on. Our first responsibility is to open the main roads. These arterials are the key to providing safe access for emergency vehicles as well as maintaining the steady flow of traffic since most residents live within a short distance of such a route. The plows then continue to plow all roads on the route to “open up” each one in sequence. If the storm continues in intensity, the trucks remain in that same pattern until the storm abates. At that time, the trucks begin to “widen out” all roads by pushing the accumulated snow back to behind the ditch line and clearing intersections. Remember, trained crews work during these storms to keep the roads open and passable. If you wish to report a hazardous condition, call the Highway Department at 754-8218. If there is a medical emergency, call 911 or contact the Town of Lewiston Police Department at 754-8477. Crews continue to monitor all roads for icy spots and areas where winds redeposit the snow in traffic lanes. Usually an application of salt is applied to all roads and streets so the riding surface remains drivable. If the accumulation is particularly heavy, the Town may use larger equipment (i.e. wheel loaders) to clear intersections or areas that have received wind driven drifts. Crews are also dispatched to clear sidewalks, upstream culvert mouths and catch basins so that melting snow can run off. You may wish to avoid a potential problem, and also be of assistance to your neighbors by cleaning off sidewalks, a catch basin, culvert entrance or shoveling out a nearby fire hydrant. Please avoid creating a hazard by discarding snow from your driveway or sidewalk into the roadway. There is no “on road parking” in the Town of Lewiston from November 1st through April 15th of each year, from 11:00 p.m. - 6:00 a.m. This includes areas adjacent to the road surface (i.e. road shoulders and driveway entrances within the right-of-way). Vehicles parked illegally or abandoned on roads are subject to towing at the owner’s expense as well as being ticketed by the Town of Lewiston Police Department. As soon as you are aware that bad weather is on the way, make sure your vehicle is off the street. This protects your car from being splashed with slush, becoming plowed in, or being hit by the snowplow or by passing vehicles. Best of all, the snowplow has space to move the snow. Mail and newspaper boxes placed in the highway right-of-way are allowed there merely as a convenience to the homeowner and the delivery persons. While the highway department makes every effort to avoid damaging these structures, it may at times, depending on visibility, be unavoidable. Therefore the Town of Lewiston takes no responsibility for damaged mailboxes or newspaper boxes. Most mailbox damage is a direct result of snow being cast off of the wing, not direct wing/plow contact. Sometimes, through no fault of the Town or resident, the post has simply rotted and the weight of the snow hitting it knocks it down. In certain situations, at the Highway Superintendent’s discretion, a mailbox that has been physically struck by a Town of Lewiston vehicle may be repaired or replaced by the department. According to the State Attorney General's Opinion No. 99-1, when a property owner places his or her mailbox in the Town's right-of-way, the Town is not liable for damage to the mailbox if such damage is caused by non-negligent snow removal activities. It has been the policy of the Town of Lewiston Highway Department to replace mailboxes and posts taken down or damaged during snow removal. However, it is suggested that you replace any expensive or fancy mailboxes or posts with a basic mailbox and post as these are the only types provided for repair and replacement. Be prepared, Be Aware and Be Patient. Before it snows, remember last year’s problems and try to tackle them in advance. If you do your own snow removal, have your tools and supplies handy. Shovels, snow blowers, calcium chloride, rock salt and sand should be ready before the season begins. If you hire someone to do your snow removal, make those arrangements early. It can be difficult to find someone in the middle of a storm. Make arrangements to have adequate food supplies on hand. Keep flashlights, battery powered radio and emergency equipment on hand in case of disruption in the power supply. Area news media will announce approaching storms and will disseminate information on school closings and meeting cancellations. WBEN Radio @ 930 AM in Buffalo, N.Y. is the radio station used by the Town of Lewiston for notification on highway emergencies. Please do not go out during or immediately after a snowstorm unless it is truly necessary. Crews have many hours of hard work to complete their snow clearing operations. Less traffic on the road means that we will be able to clear the roads more quickly and completely. Under the best of conditions, it will take us at least 4 hours from the time it stops snowing completely to complete our snow removal operations. Remember, whether it is your driveway for which you are responsible or the 65 miles of roads for which we are responsible, snow removal is an arduous and time consuming task. Please understand that the Highway Department cannot shovel ridges or wind rows from your driveway entrance, nor can we plow private property. WARNING: According to Section 1219 of the Vehicle and Traffic Law and Section 214 of the Highway Law of New York State, snow removal operators (plow services and individuals) on private properties may not push, pile or blow snow out into or across any public roadway system. When shoveling out the mouth of your driveway, throw it to the right of your driveway as you face the street or “downstream”. Throwing or plowing snow in the road is not only illegal it can create a patch of snow and ice that freezes over and causes a hazardous condition. Besides, it will only be re-deposited when the plow comes around again. If at all possible, finish clearing your driveway entrance after the final widening pass has been completed. Helpful Hint: Leave a strip of snow at the edge of your driveway; this will block some of the snow from entering your driveway when the plow widens the roadway. The final widening pass is usually completed approximately 8 to 10 hours after the snow stops completely. This, of course, depends on the severity of the storm. Plan alternate ways and extra time to travel to main routes and to your place of employment. Remember, slow down, brake slowly and allow plenty of room between you and the vehicle ahead of you. During times of reduced visibility, watch for pedestrians, snow removal equipment, and disabled vehicles. Maintain your vehicle properly. Take time to thoroughly clean and defrost your vehicle’s windows before “hitting” the highway. Equip your car with snow tires and keep your headlights and taillights clean and on at all times. Why does the Highway Department provide snow and ice control? To keep roadways open and safe for emergency response by the Police, Fire and Ambulance services and to provide access to home, work, school and mobility to all Town of Lewiston residents as well as the traveling public. Why does the Highway Department have to plow from ditch to ditch? To keep the streets clean of snow and ice and allow melting snow to reach culverts and catch basins. I cannot shovel my driveway because I am elderly or disabled, what should I do? Make arrangements with a family member, a friend, a neighbor or hire a contractor to do this for you. My car was towed, where is it? Call the Town of Lewiston Police Department at (716) 754-8477.
Who can I call if I have a question regarding the Town’s snow removal service? Call the Town of Lewiston Highway Department (716) 754-8218.